I've split the DIY Minipops Clone thread into Minip7 and MP7. One another to avoid missunderstandings. This thread will hanlde MiniP7 which is the Clone of the origonal. Rendered and Frontpanel that arrived today. Here you can find the whole development process, soundfiles, PCB renders etc. 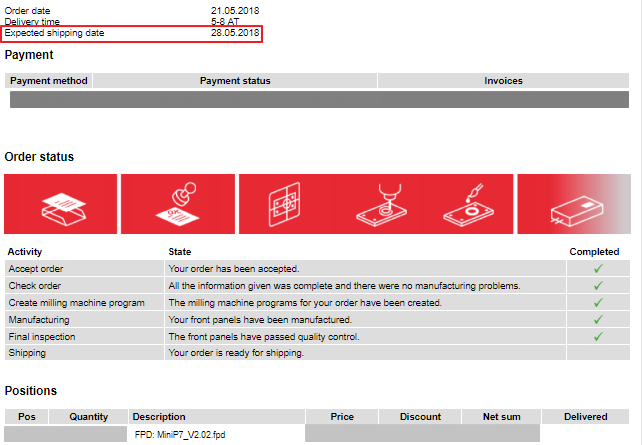 In attachment to this post one can find the order form for the MiniP7. 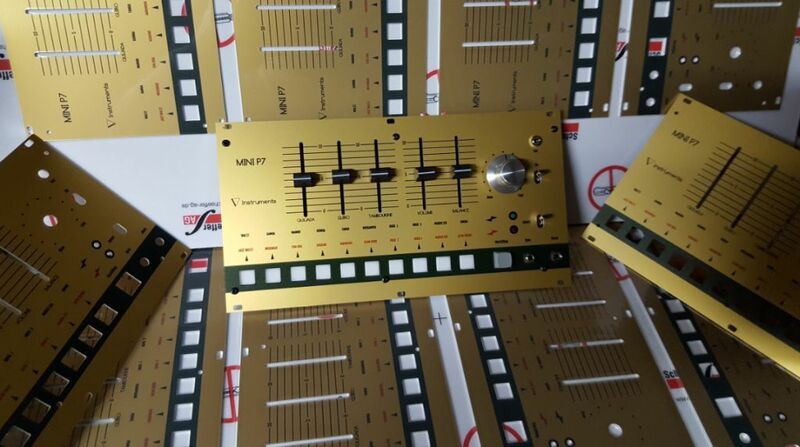 The order opportunity for the MiniP7 ends today in week. NANO-Jorge The panel looks nice! today is the last day I will be accepting orders for the MiniP7. no more orders accepted for now. 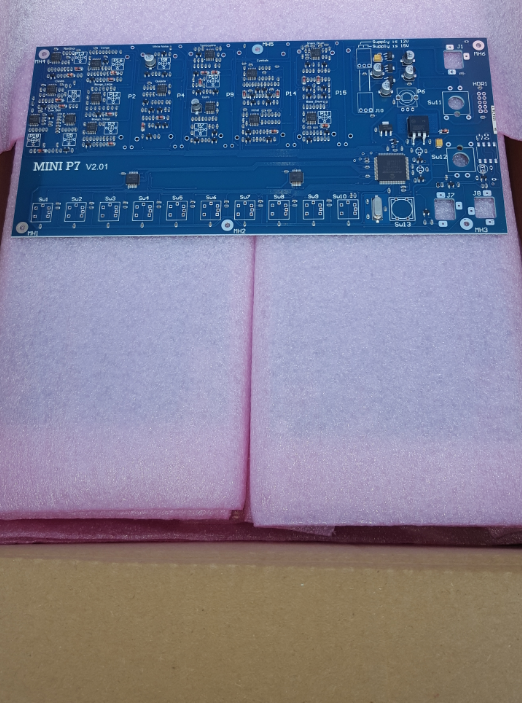 PCBs and Components for the first production run are ordered. I'll order the Fronpanels when the populated PCBs arrive. Pls allow 5-6 weeks for the PCBs to arrive, according to the initial time frame below. 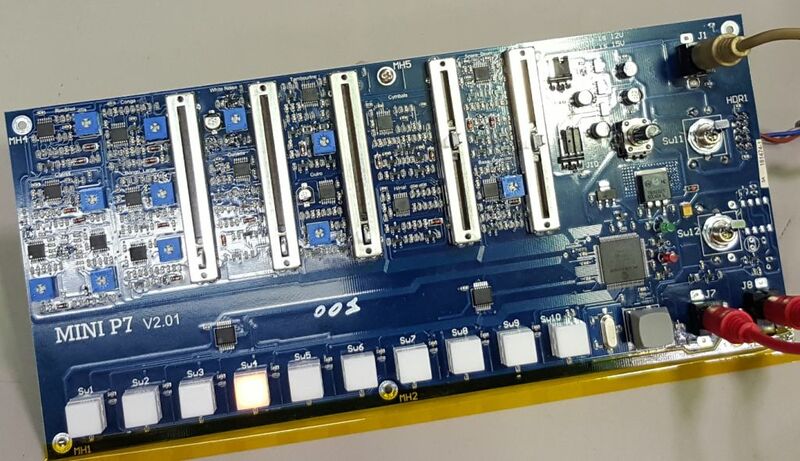 Order materials and populated PCBs end cw15 Done 3 days delay compared to initial planning. I was some time off, bit is it still possible to order the MiniP7 ? 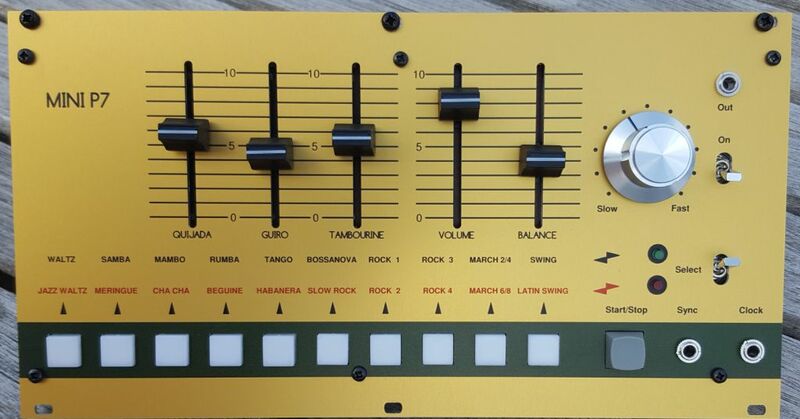 It really would to be a fantastic add-on to my synth collection. And sorry for asking, but is there any chance to add a (3rd party) basic Midi-interface (as the Mini-implant) on your MiniP7? You're a bit late, but oh so lucky !! Of those 5, I have 3 left. I can tell you which serial nr you'll receive. if you still want to order, pls use the latest format published in this thread in the first or third post. 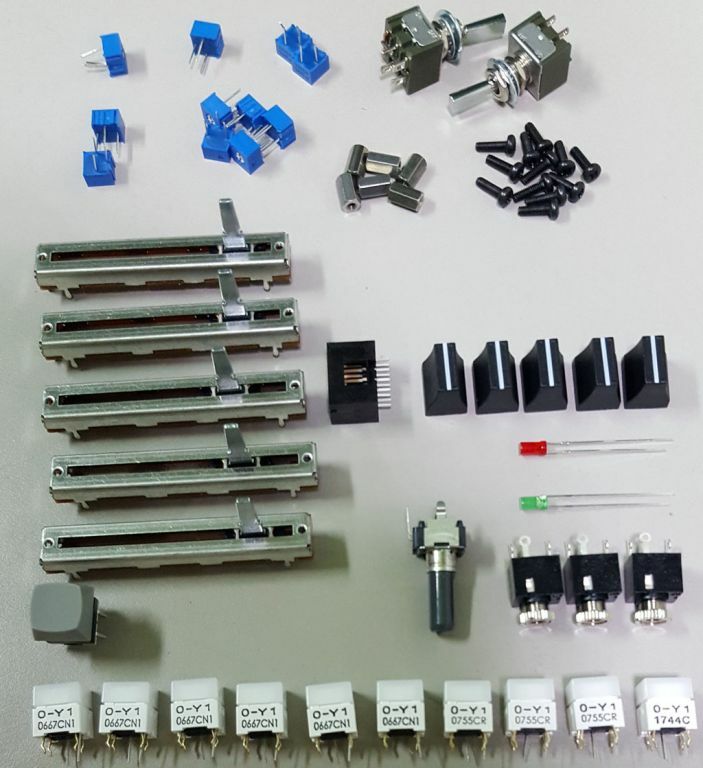 TH components can not be ordered, from me, anymore as the kits have been made. As I will only order the FPs after a first mechnical fit on the final boards, I can still expand my order of frontpanels. 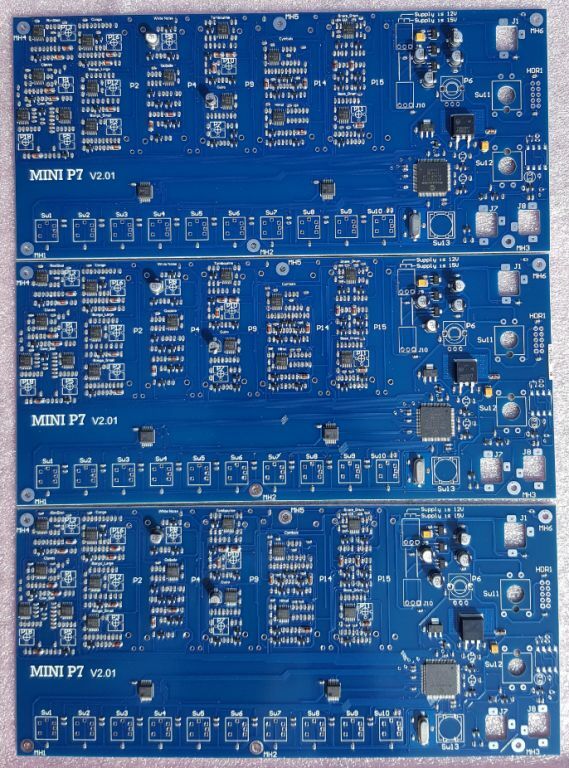 So SMD populated PCB and FP can still be ordered. I will further update about debugging and assembly over the next couple weeks . As soon as the first one fits my FP mechanically, I'll order the rest of FPs. SMD population (subcontractor needs about 5-6 weeks) cw21 Done 1.5 weeks faster then expected compared to initial planning. Running from the first time ! I assembled one PCB this afternoon and powered it up. After programming the processor, it ran from the first time. Apart from that, it's all looking very good. At this tempo, debug should not take a couple weeks. I guess it's time for me to start thinking about enclosure and power options. I had to redimension a couple values. No trace cuts or additional wires. Audio demo already recorded but still to be put in video format. That's for later tonight or tomorrow. It's a dsPic33FJ256GP710a, way too big for the application, but the standard I use for most of my projects. And here's a first audio demo of the first MiniP7_V2.01. You may find some slight overdrive from 30 to about 40 sec. Below a movie in which two MiniP7 are synchronised by means of a synchro signal and external clock. FrontPanels are about to arrive. I will complete the kits and send out the requests for payment during the coming days.